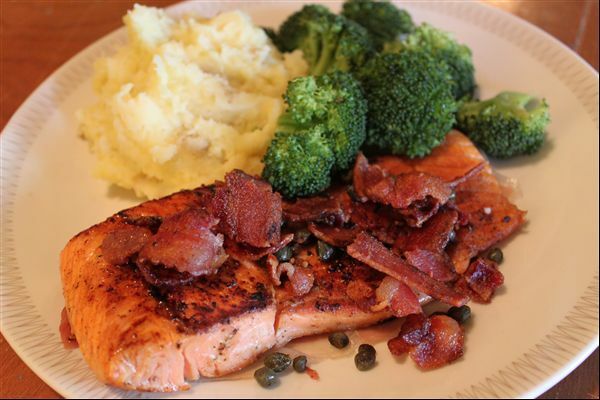 I made this recipe using steelhead trout I got at Costco. I thought it would be more like a white meat fish, but it seemed a lot like salmon. It was a super simple recipe, but it was basically fish with bacon – not saying that’s a bad thing, but it seemed very simple. I actually added capers right at the end, mostly because one of my sons loves capers & the last time I cooked fish it didn’t have capers & he was sad. We all loved the fish & I really liked the smoky, saltiness of the bacon with the fish. For more details of this challenge, click here. Categories: Cooking, Creativity | Tags: 30 Days of Creativity, cooking, recipe | Permalink.